Pencil on paper. 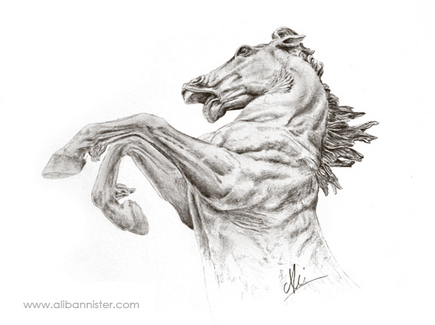 Drawn from the fabulous bronze statue ‘The Horses of Helios’ by Rudy Weller in Piccadily Circus. The Greek legend said that each morning at dawn Helios woud rise from the ocean in the east and ride in his chariot, pulled by four horses - Pyrois, Eos, Aethon and Phlegon - through the sky, to descend at night in the west. Prints from a limited edition of 250.